For the past 6 months or so I’ve been committed to driving the speed limit. Anytime I’ve seen a sign with the speed limit posted I’ve driven that speed or lower. It’s been an enlightening experience for me and I wanted to share my motivation, my experience and some data from that time period. Cash rules everything around me and my motivation to drive the speed limit was money. I received a speeding ticket late last year for going 35 in a 25 in a suburban neighborhood. After traffic school the damage was about $300. I felt some need to change my behavior and avoid money going to waste like that. I decided to drive the speed limit all the time to avoid speeding tickets. Here’s what I learned. I’ve been driving for many years but this recent commitment to driving the speed limit has made me painfully aware of the impatience of other drivers. No matter the speed limit, I find myself being tailgated. I find myself being tailgated in school zones and in areas with speed bumps every 100 feet. Everyone is in a hurry and I’m not so I supposed I need to get out the way. I’ve never been a speedster but in Utah the speedlimit is 70 MPH on most freeways and as much as 80 MPH on certain rural areas on the freeway. I drove 80 MPH in 70 MPH zones in Utah for most of my driving until I started driving the speed limit. The thing that became immediately obvious to me is that generally, every lane is a passing lane. No matter where I am people try to get me to move. These dynamics make it hard to pick a lane to drive the speed limit. I still haven’t figured it out, but when there isn’t much traffic on the road I can get by driving 70 in the right most lane. I change lanes a great deal less than I did before and I find myself much more aware of how long it takes to drive places. I feel like I am under control on the road and can easily get myself out of any trouble. I also feel like I slam on my brakes much less and am less likely to honk at anyone. When giving a ride to a number of friends they noticed that I was driving slower. This was often the case because we were late to something or they just expected me to drive normal speeds. It was important to me from the outset to never , even if I was late. Most friends were supportive, some thought I was just being weird. I pride myself in being someone who is on time and that is still largely true. I did find myself late more than I’d like to be during these past 6 months. It was especially hard when I was ~5 minutes late and speeding might have actually helped a bit. As time has gone on, I feel like I’ve just adapted and left earlier or have just gotten used to being patient. I’m committed to driving the speed limit from now on, for all the positive reasons above and for two additional ones. First, with the increased data and footage available surrounding encounters with the police, I’ve decided my life is too important to speed. Many may read this and think it’s extreme — what would law-abiding, middle class person, Black or not, have to worry about being killed by the police? I never want to be pulled over for speeding, or for any malfunction to my vehicle. I don’t want to be “perceived as a threat” and lose my life over nonsense or racism. I believe that following the speeding laws works toward that aim. You can disagree with the entire premise, but for my wife and new child that’s the decision I’ve made. Secondly, I hope that once my daughter is old enough to get behind the wheel that she sees the value in this line of thinking as well. She’s just 3 weeks old and while that’s many years from now I hope after 16 years of being in cars that drive the speed limit that she’ll at least consider the value. 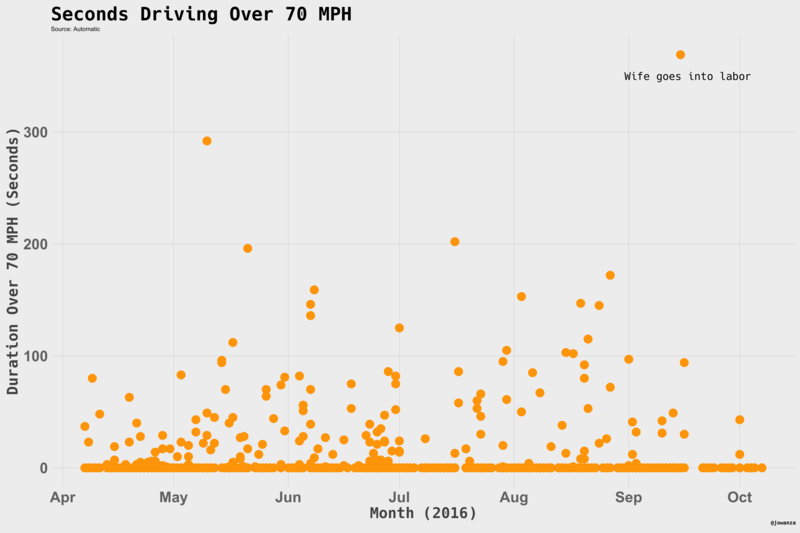 After making this chart, my wife pointed out that some of the higher values for seconds over 70 MPH were in fact hers. We went through our calendars and confirmed many of them. Since these incidents were so few compared to the overall I just left them in the dataset. This is a correlation chart, it shows the correlation between a handful of data points across the 6 month period. I did exceed the speed limit at certain points during my 6 month experiment. These times were limited to: getting in front of a car to exit or make a turn and 3 weeks ago my wife went into labor and out of fear of missing the birth I sped for a few minutes before coming to my senses. I keep track of my speeding on the freeway with my Automatic (It lets me know when I drive over 70). 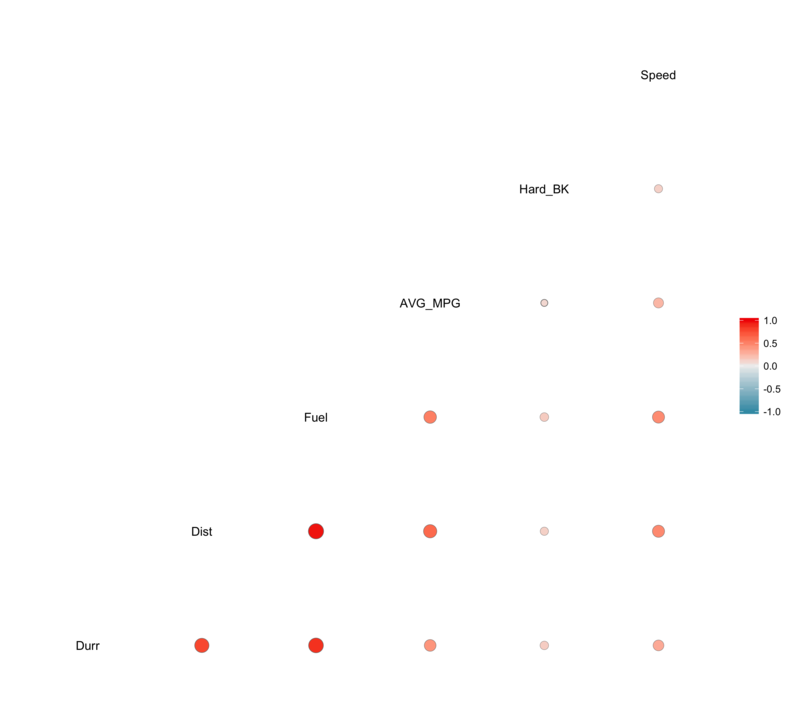 Over the course of this experiment, I’ve driven less than 1% of the time over 70. This includes trips to areas where the speed limit was 80 MPH. Whenever I wasn’t on the freeway I went the speed of posted signs. I drive a Subaru Impreza – a decently fuel efficient car but not so much in the city for anyone wondering. A commentor on Reddit noted that I should be mindful of staying right if I am driving slow and I wanted to clarify that point. I am often passed when in the right most lane from people using the exit lane as a passing lane. It is also commonplace to be hassled when passing someone in the rightmost lane in the lane immediately left of it. Finally, I only drive in the leftmost lane if I need to enter the HOV lane or exit the freeway when the exit is on the lefthand side.